One of the most challenging parts of maintaining a healthy diet is making nutritious choices while dining out. Many restaurants can’t – or won’t – make modifications to their meals to “clean” them up. Others will have a small and sad list of salads to choose from, which can be less than appetizing while friends or family are indulging on fries or the dessert menu. But at STREET, dining out does not have to equal an unhealthy diet. STREET has a reputation for its decadent and higher calorie count items like curry fries and cemitas, but STREET General Manager Campbell Lozuaway-McComsey says clean eating can easily be achieved at his establishment. STREET is a family owned establishment in the West End of Portsmouth, New Hampshire, and located right around the corner from MISSION. Campbell’s mother, Michelle Lozuaway, and stepfather, Josh Lanahan, opened STREET’s doors in 2011. The restaurant was a testament to their love of food and travel, and it has been extremely well received. They recently opened two more restaurants, STREET’za and b.Bar, located adjacent to one another and in the same building as STREET. 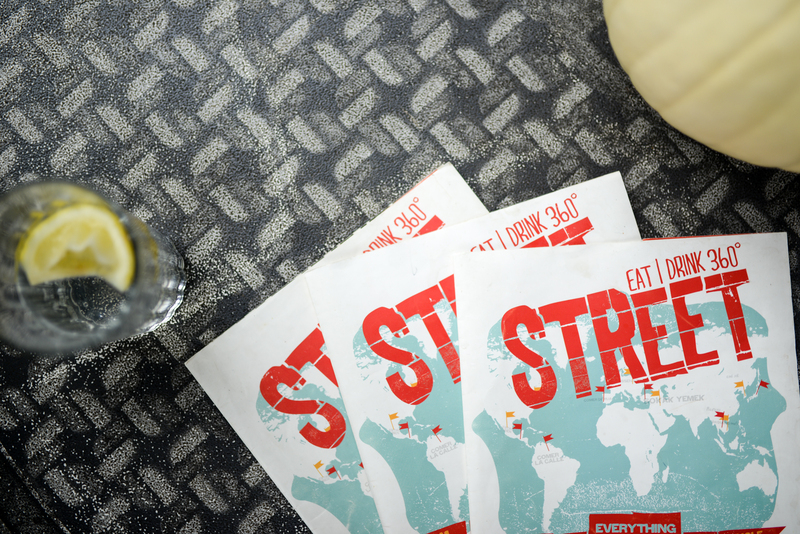 STREET offers a wide array of street foods from all over the world. The restaurant has a large lunch, dinner and Sunday brunch menu with an eclectic assortment of dishes, including everything from fish tacos to bibimbap and hearty Yuca fries. Their team prides themselves on the consistency of the food they serve; you will get the same delicious dish every time you order it. “We wanted to offer the best dishes you can get from all around the world, in one place,” Campbell said. And that is exactly what they have accomplished at STREET. When you think about street food, healthy probably isn’t the first word that comes to mind. However, STREET is dedicated to making each dish the way you want it, no matter what modifications need to be made. Many of their wait staff and cooks are vegan, vegetarian, gluten or dairy-free…so they’re understanding and accommodating when it comes to diet restrictions. They encourage their patrons to ask questions about how their food is prepared. STREET offers a variety of burgers and sandwiches that, if ordered as-is, may not be the healthiest option despite how delicious they taste. However, many of their burgers or sandwiches can be ordered as a salad, still flavorful and satisfying without the guilt of a large bun. 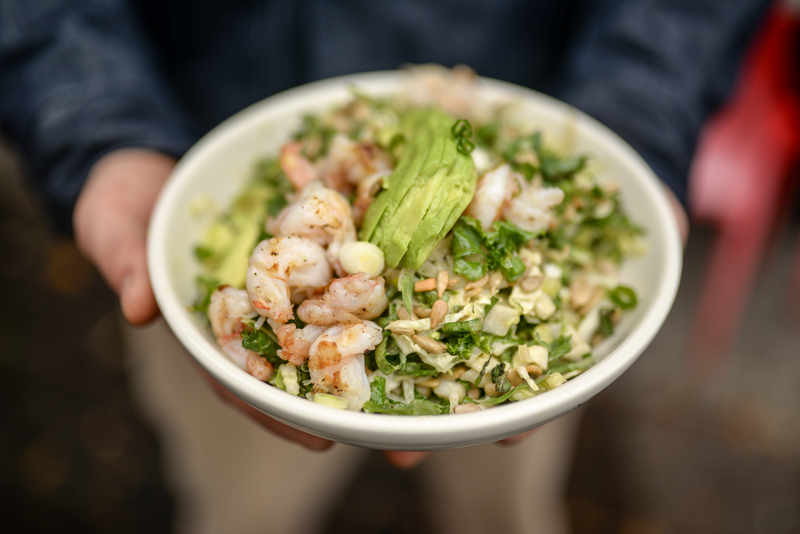 Enjoy the Seamita, a seafood patty made of scallops, shrimp and Pollack, over a bed of mixed greens, avocado, fresh cilantro and pickled onion. So fresh, much lighter and just as flavorful. The fish tacos can even be served with lettuce “shells” instead of tortillas. The Extra Yum section of the menu offers a variety of sides that could be added to any appetizer or main dish, or combined to create your own healthy dish. Start with a crispy rice cake, add avocado, BAP veggies (light on the oil) and shrimp and you have yourself a well-balanced, guilt-free meal. You can even choose a healthy option at Sunday brunch. Workin’ on My Beach Bod is a veggie and egg white frittata topped with avocado with a butter lettuce and white bean tomato salad. You will feel a lot better about sipping on a mimosa alongside this clean brunch item! And many of the items on the menu are healthy as-is. When asked what the healthiest item on the menu is, without hesitation, Campbell pointed out the Miso Healthy salad. “It’s right in the name!” he said. This vegan-friendly salad is a mixture of fennel, napa cabbage, kale, celery, spinach, scallion, fresh herbs and snow peas tossed together with toasted sunflower seeds, white beans and a lemon-miso dressing. Equally delicious is the Singapore salad, with daikon, cucumber, cabbage, carrot, scallions, cilantro, mint, Thai basil and peanuts and drizzled with a sesame ginger dressing. Campbell even recommends this salad without dressing, allowing the fresh herbs to shine. The majority of the dressings and sauces are made in-house and they offer lean protein add-ons like grilled chicken, ficken (fake chicken), white fish and shrimp. After years of yo-yo dieting and trying to develop a healthy relationship with food, Campbell’s philosophy on food and diet is simple and relatable. He strongly believes that rather than being overly obsessed about physical appearance, weight and depriving yourself of foods you love, you should enjoy food and feel good about what you’re putting into your body. You will be a happier, better version of yourself and will naturally want to make healthier choices (most of the time). It’s important to find a balance between eating clean and indulging, and at STREET you can do both. If you are someone who wants to get fit, stay healthy, etc. but loves good food and enjoys dining out, STREET is an excellent choice. You don’t have to worry about falling off track here. You ask and they will deliver. The food is always delicious, the service is great and the entire staff is happy to make your dining experience exactly what you want.